We're the perfect park to stay & rest or explore the Seattle area. See the Space Needle-Pike Place Mkt-Boeing-Bellevue Shops-Snoqualmie Falls. Special RV Parking while cruising or flying out. Book early-we fill up in Summer. This is a rather large park in a lovely setting around the lake. The driveways and site pads are asphalt and are in good condition. We had a pull through site will full hookups. The site was somewhat narrow and some of the sites are significantly out of level. There is a picnic table but not really room enough for it. There is no patio or fire pit. We chose this park because it offered “cruise parking”. This consists of a number of side by side parking spots and access to an electric pedestal where we could plug in for 20amp service in order to keep our refrigerator running while on the cruise. The staff provided clear instructions for using the cruise parking. The restrooms are kept clean and the laundry is an excellent value at $1.00 for wash and $1.00 for dry. They offer paid WiFi but we didn’t use it. It allows for 1 hour free usage daily but when I tried that it wasn’t working very well. Overall, it’s a lovely setting and we were pleased with the cruise parking, but not overly enthusiastic about the RV sites. We paid $44 per night for the RV site and $10 per night for cruise parking. Beautiful park. The only drawback with the lake was the geese. They were very noisy early in the morning. The only other drawback was the internet. You get a coupon for one hour each day with 1 device and 1 meg service. If you want more time you have to pay more for each device each day. Other than that, the residents were friendly and it is a well maintained park. Nice RV park, clean and well run. A little tight and sites near lake not very level. My one main issue is when I asked about any type of discount, especially Military, I was told "we are a private park and do not give discounts". I was put off by this response. This is the first time I have encountered this type of attitude from any campground. This is un-sat in military speak. Lake Pleasant RV Park, Bothell WA. Very nice, level, paved sites. Laundry and showers were clean and well kept. There were friendly staff that caters to cruisers. We stored the RV while on a cruise to Alaska. Great rate and we could plug in while gone so we kept the refrigerator going and did not lose anything. To be sure, we filled a small cup of water, froze it the night before we left and then put a nickel on it before we left. If we would have lost power for a long time while gone, the nickel would have not been on top of the ice in the cup. We chartered a limo "Semper Fi" to take us to and from the ship. Very reasonable and a great ride. The drivers were friendly and professional. It cost just a few dollars more for the limo ride than to store the camper at the port. With the Safeway grocery store and gas just across the street from the RV park, it was very easy to get fresh supplies and gassed up for our trip after the cruise. Some advice, sign up for the Safeway card for savings and use a debit card or cash at the gas for even more savings. This is really a wonderful place to stay. I can only think of one downside and that is their wifi arrangement. You get only one hour per day and it must be used at exactly the same hour every day. After that you can sign up and pay by the hour or day. Why not just raise the price to stay by $5.00 and let it be included? Other than that it is very scenic with small lakes within. Easy access to all that Seattle has to offer. Will definitely stay again. 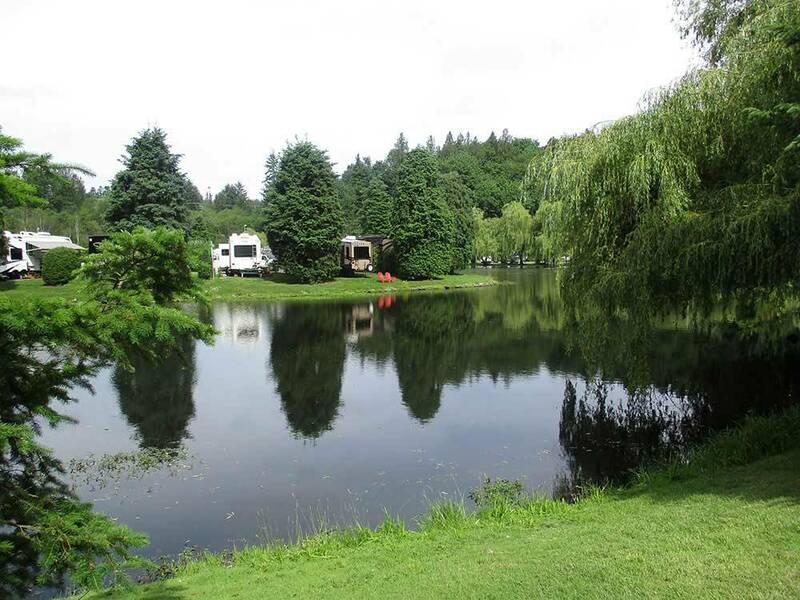 Truly a nice serene setting near Seattle where any RV park space is hard to find! We were pleased to get the last available spot. The staff are professional and friendly and extra helpful. We like the privacy dividers/greenery between the sites and also the lake view. Everything here reflects quality whether it is the landscaping, the playground, roads or traffic. Very pleased with this property and we hope to return! We stayed here for a month and we will never stay here again! The entire time we were uprooted and shuffled around the park every couple of days because the office management does not know how to operate their reservations software. As a result, overbookings, double bookings and frequent moves within the park are common place. This used to be a great place to stay, but we will not return. This was a nice campground with nice friendly staff. Site was a pull-thru but was not level. Utilities were good and roads in and out were paved and easy to navigate. Park is close to shopping and restaurants. The Boeing factory tour is not to far away. Good place to stay if visiting Seattle. We stayed at Lake Pleasant for two nights. It was a nice place to stay in the suburb of Bothell near Seattle. We unhooked and took a day trip to the Space Needle, the original Starbucks, and Pike Street Market. Lake Pleasant RV resort was about 30 minutes from downtown Seattle. We recommend driving to the Space Needle for parking and then taking the monorail to downtown and the waterfront area. The staff at Lake Pleasant were friendly, and there were many sites on the small lake with ducks and geese. There is a Safeway up from the resort and across the street which made it very convenient to load up with food and supplies for the next leg of our journey. We would definately stay at Lake Pleasant RV resort again. 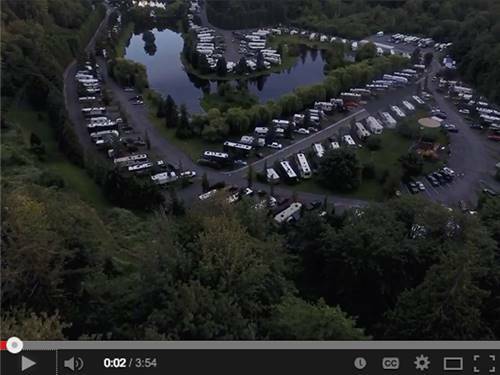 It is one of the best RV resorts we have been guests at during our cross-continent travels. Great place to stay while in Seattle area. Close to freeway entrances but park is quite and peaceful. Showers were clean and free. Good separation but most pads were asphalt and very uneven. Lake view sites were all full timers. Clean facility..we paid $44 no discounts available. We have been staying at Lake Pleasant at least two weeks a year for the past 8 years and have never been disappointed. The park is beautiful and the staff is outstanding. Very close to shopping and the freeways and lots of things to do. I would recommend this park for everyone. We stayed at Lake Pleasant for three nights. Great private shower/bathroom facilities. Helpful staff. Within walking distance to grocery store, restaurants and retail. We accessed the bike trail into Seattle, and though quite a distance, it was a wonderful ride to and fro. Paved RV sites, very clean and "scenic," as we backed up to a small lake. Would definitely stay there, again, when we're in the Bothell/Seattle area!